Raastech Blog: Do you need ESS when using core Oracle SOA Suite 12c functions? Do you need ESS when using core Oracle SOA Suite 12c functions? Are you new to Oracle Enterprise Scheduler (ESS)? Did you know that ESS is included for free, for no extra charge, with your Oracle SOA Suite 12c license? ESS is a first-class, no-frills, simple-to-use scheduling service that gets the job done and is a welcome addition to the Oracle SOA Suite 12c platform. It provides the ability to run different job types according to a preconfigured schedule, including Java, PL/SQL, binary scripts, web services, and EJBs distributed across the nodes in an Oracle WebLogic Server cluster. 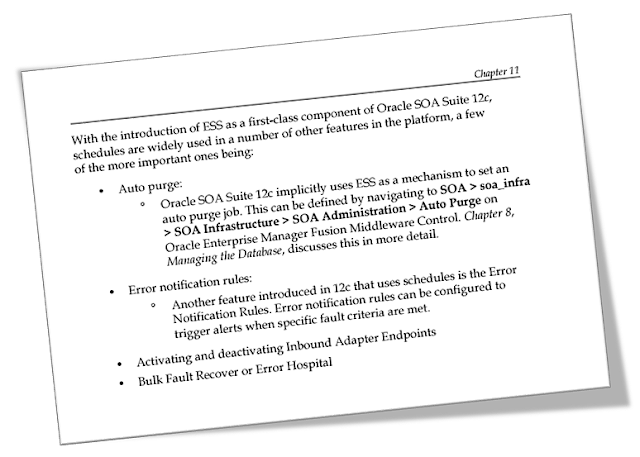 For more information, check out our excellent book Oracle SOA Suite 12c Administrator's Guide (shameless marketing, I know!). We introduce and explain ESS concepts, terminology, scheduling, compatibility issues, purging, tuning, and so much more. Enjoy this snippet from Chapter 11!